Overmarine has revealed details of the new Mangusta 132 series, a natural evolution of the successful Mangusta 130 superyacht. Last year, Overmarine announced the Mangusta 110 and the Mangusta 94, successors of the Mangusta 108 and the Mangusta 92 series respectively. 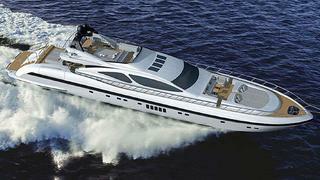 This year, it's the turn of the Mangusta 130, which now becomes the Mangusta 132. Designed by Stefano Righini in collaboration with the in-house team, the Mangusta 132 follows the recent modifications seen on the latest maxi open yachts delivered by the Italian yard. From the Mangusta 165, she takes the latest hydrodynamic improvements of the hull. And from the latest models, she takes larger windows and skylights to bring more natural light inside, and a spacious sun deck with a second helm station. The interior will follow the owners wishes. In standard format, it accommodates 10 guests in five cabins, including a full-beam master suite. The two 4,600hp MTU engines are now combined with new S3Np KaMeWa waterjets giving a top speed of 36 knots, less vibration, and less noise. And to improve the comfort, this new model is fitted with gyroscopic stabilisers. Visit Overmarine at the forthcoming Cannes Boat Show to discover the latest models, and the new Mangusta 94.